Hyper Martial Arts is excited to return to Huntington Beach, California for Pro Camp 2019! Known as “Surf City USA”, it is the action sports and lifestyle capital of the world. 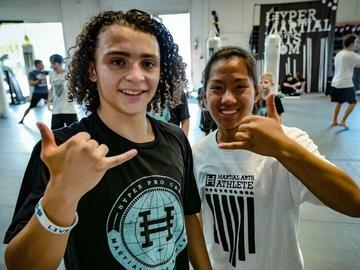 Hyper Pro Camp is a once-a-year opportunity that builds unique skills. Learn the most innovative techniques and combos from pro level athletes and trainers that will take your training to the next level. Plus, get direct feedback and tips on your competition forms that you can implement and perfect during Pro Camp. Together we will make this the best summer ever! Hyper Pro Camp is THE place to train with your friends, meet athletes from around the world and build friendships that will last a lifetime. Achieve a new level of success with tips from Pro Athlete trainers as they break down their favorite kicks and combinations that will give you the advantage in your competition forms. We promise you will leave Pro Camp with a new level of inspiration and motivation to take your Martial Arts training to the next level. See you in Huntington Beach! Learn new hand combos, kicks and sections from world champion athletes. Plus, get feedback on your form to help you improve your tournament scores. Pick your favorite weapon (Kama, Bo Staff, Double Bo Staff, Sword or Double Chux). Learn new tricks and perfect your solid foundation strikes. Pro Camp will be full of opportunities to learn and perfect new tricks and get tips from Pro Athletes. Plus, throw down your best combos in a trick circle. Work with pro level trainers & world champion competitors and get direct feedback on how you can improve your forms, weapons, and tricks. The Hyper Instructor Certification teaches instructors how to run cutting-edge classes with solid foundation teaching skills, powerful forms drills, dynamic kicks & tricks, running successful camps, workshops and events. If you are an Instructor looking to get the most out of your Hyper Program, or an junior instructor looking to advance your career and teaching abilities, this is the course for you! I hereby assume all risks and responsibilities associated with my participation in any training activities in this program. I understand that it is my responsibility to monitor my own condition and equipment throughout all activities. I will immediately notify the instructor and/or trainer and stop participation if any unusual symptoms or circumstances occur. I hereby release and disclaim Hyper Martial Arts, it's agents, employees, associates and affiliates, and any others connected therewith from any and all claims, suits, losses or related cause of action for damages incurred during or arising in any way from my participation in Hyper Martial Arts programs or the use of any equipment or information endorsed by Hyper Martial Arts. On behalf of my family, my estate and myself, I waive any liability, responsibility or negligence of Hyper Martial Arts for same.